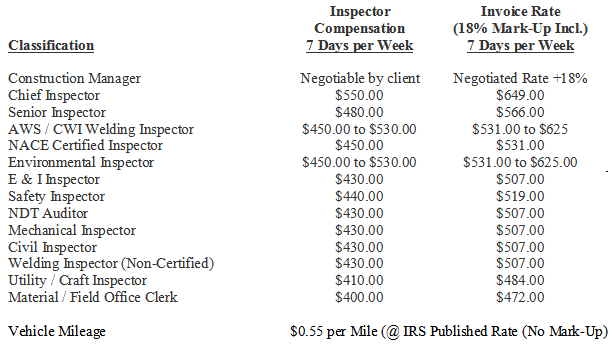 Inspector Compensation includes Salary, Per Diem (IRS High/Low Rate), Cell Phone, Computer and Digital Camera. 18% Mark-Up includes all Taxes, Insurance, Overhead, Profit, OQ, Safety and Drug Testing, when applicable. Holidays that fall within the time frame of the project will not be excluded from the daily rates. Client-approved out-of-pocket expenses, such as parking fees, tools, supplies, etc., will be billed to the client at cost plus 5%. Allowed reimbursable Travel days are as follows: For up to every 500 miles traveled, 1 day travel pay plus mileage will be paid up to a 3-day maximum. Zaval-Tex Inspection has a comprehensive benefits program including available health insurance, direct deposit of payroll, and credit union membership which assists us in attracting and retaining qualified professionals. Zaval-Tex Inspection has employed a full-time corporate Safety Coordinator. This individual is an OSHA –Approved Construction Outreach Trainer. The Zaval-Tex Inspection Workplace Safety Plan has a 100% compliance rating. Zaval-Tex Inspection provides each employee a personal copy of the Workplace Safety Plan. Safety training is provided by Zaval-Tex Inspection trainers and/or by recognized, credentialed third-party trainers. An in-house database recordkeeping/tracking system maintains an individual record of all training provided. Zaval-Tex Inspection also posts all safety training to the ISNetworld database for easy client access and confirmation of each employee’s records, along with Operator Qualification records required for all personnel whose work tasks fall under the jurisdiction of the United States Department of Transportation pipeline regulatons. Zaval-Tex Inspection tracks all training expiration dates and notifies employees when updating is required in order for their certifications to remain current. Supplemental Training: Zaval-Tex Construction has the facilities, training aids, and the availability of qualified instructors to provide additional training requested by the client. This training is billed at Zaval-Tex’s actual cost. Personal computer training modules are also provided to our inspection personnel as a method of continuing their education. The employee completes training modules covering various relevant topics, with tests forwarded to a third party for grading. To comply with the U.S. Department of Transportation’s (DOT) Operator Qualification Rule issued on October 26, 1999, Zaval-Tex Inspection adopted the API/COOQ’s Covered Task List and utilizes three of the available major qualifications: Veriforce, The National Center for Construction Education and Research (NCCER), and MEA. Zaval-Tex Inspection provides assessments to our employees and others who may wish to utilize Veriforce, NCCER or MEA in their program. Zaval-Tex’s Anti-Drug and Alcohol Misuse Prevention Plan complies with all requirements set forth by the U.S. Department of Transportation Research and Special Programs Administration requirements of 49 CFR Parts 199 and 40. Zaval-Tex Inspection is a member of the Pipeline Testing Consortium, Inc., who provides all of Zaval-Tex’s testing and record-keeping for these programs. Files are available for audit through the consortium. Should a client desire, copies of our plans are available upon request.